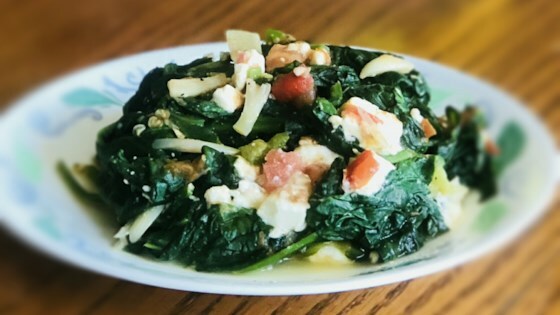 "This a quick vegetarian recipe with fresh spinach, feta, and tomatoes that's ready in 15 minutes. Serve as a side or I have also eaten it as a main with crusty bread if I only want a light meal. Works over pasta as well." Wash spinach and place into a pot while still dripping wet. Cover and cook over medium heat for 5 minutes. Drain excess liquid. Add tomatoes, feta cheese, and garlic and cook for another 5 minutes. Season with salt, pepper, and nutmeg. This is pretty tasty but then again I like anything that contains spinach. I didn't measure anything but I did add a chopped serrano chile. Very quick, easy and simple. Okay but nothing great. I did work for putting color with a bland looking beef stew!